Elastic Load Balancer access logs capture information about requests made to load balancers and can be used to analyze traffic patterns and troubleshoot issues. These logs contain details such as the time the request was received, the client's IP address, latencies, request paths, and server responses. Follow the below given steps to add Amazon ELB access logs as a data source in Cloud Security Plus. Login to the Cloud Security Plus console. Go to Settings and click on Add Data Source. Select ELB Access Logs from the Data source drop-down menu. 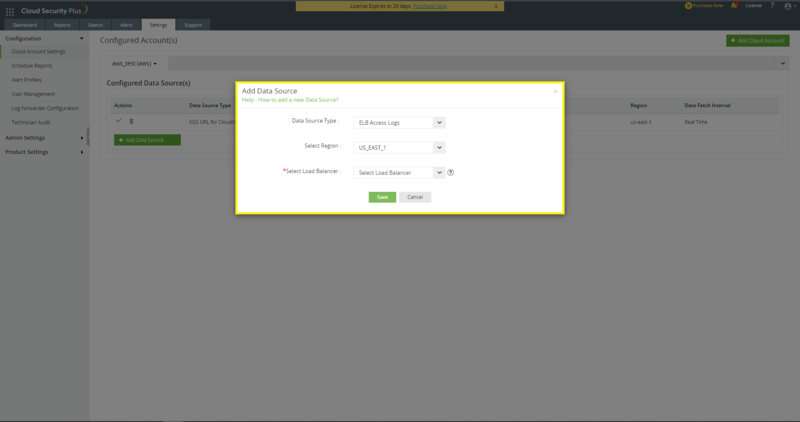 Select the Region and Load Balancer for which you want to enable access logging.